THE BOAT:“Mistress” was built by one of New Zealand’s leading custom boat builders, Alan Tongs, and launched in January 2001.The timber used in construction is Gaboon (similar to Okume) which was logged in Africa and sent in log form to an Israeli lamination plant which is approved by Lloyds of London. The Hull diagonals are all vacuum bagged (no nails) and epoxy saturated, which is a very strong method of construction. The Hull and superstructure are glassed over for added strength. The interior features American Cherry and Alcantara Fabrics. “Mistress” was designed to be a luxurious, comfortable and self-reliant live aboard vessel. She accommodates 7 on an overnight basis. Massive Freezer Space for Baits etc. Custom rods with 4kg(8lb) to 60kg(130lb) with Shimano or Penn reels as appropriate. An interesting and useful feature is that when fishing we display the main charts plotting system (C-Plot Pro) on the computer in the saloon and one of the depth sounders and the C-Map Plotting system on the TV. That way the anglers and deck crew can always be sure we are in the right place! They say a picture is worth a 1000 words. On that basis a video is worth millions! We want our Anglers to have a permanent memory of their trip on “Mistress”, their fishing success and the memorable moments of their trip. Consequently “Mistress” is equipped with three fixed cameras which are recording all day to three HD Digital Video Recorders. At the end of the day we edit these, eliminating all the moments of anticipation and retaining all the exciting action. There is also a self-contained Hatcam on board to capture the action from either the Anglers or the crewman’s perspective. Our on board computer can edit all video and make a movie. So at the end of each trip our Charterers have a DVD with ever lasting memories of their experience. 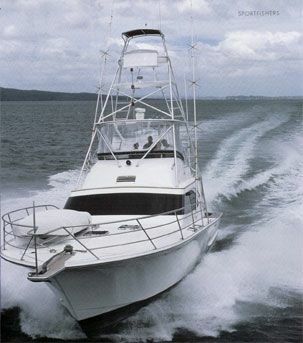 Mistress is an extremely comfortable sea boat purposely built to handle fishing in seas that at times, can be less than desirable. 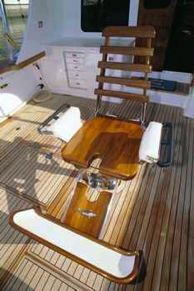 There was no compromise when designing the hull and cockpit to ensure Mistress can fish when other vessels may have to stay in port. We recognize that in today’s modern world it is necessary for people to be able to stay in touch with relatives, friends, colleagues and business contacts. Consequently “Mistress” has an on board Computer with full internet and email facilities. We also have a Mobile (cell) phone with reception in most areas of the Reef as a consequence of its aerial system. When we are out of mobile range then we bring out the Satellite phone. Thus when you fish on “Mistress” you need never be out of touch with the rest of the World.